This kind of preparation is perfect when I do not have too much time to prep and stand by the stove and oven. I just put everything together, cover and wait for it to be ready. On crazy busy evenings, it is exactly what I need. Return the chicken to the pan, add the stock, and stir gently to combine everything. Bring the mixture to a boil, then reduce the heat so it bubbles gently but steadily. Add the thyme and lemon slices. 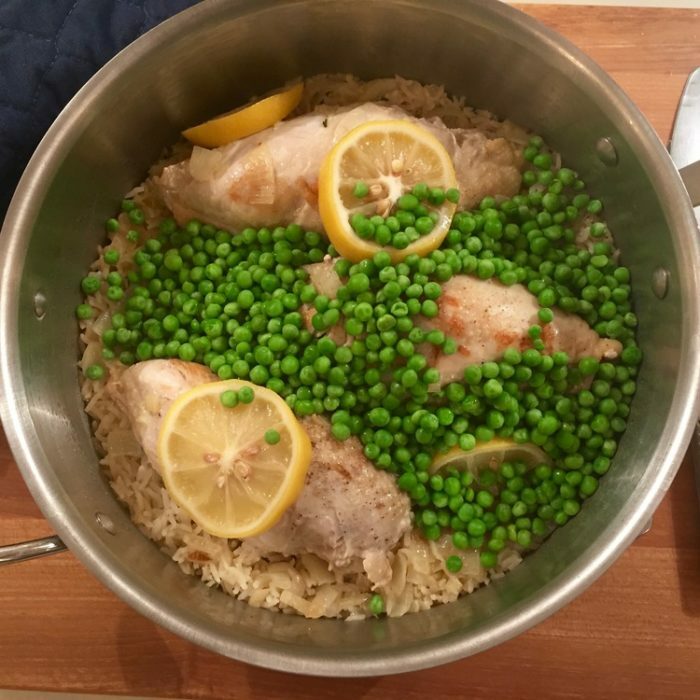 Cover the skillet and cook, undisturbed, for 20 minutes, then check the rice and chicken. The goal is to have the liquid absorbed, the rice tender, and the chicken cooked through. If the rice is dry but nothing is ready, add another 1/4 cup water and cook for another 5 to 10 minutes. The meat is done when a quick-read thermometer inserted into the thickest part of the thigh reads 155–165°F. Remove the skillet from the heat. Taste the rice and adjust the seasoning. Add the peas, then cover the pan again and let it sit for 5 to 15 minutes. Remove the chicken out of the pan and transfer it to a serving platter. Fluff the rice and peas with a fork and spoon it around the chicken.